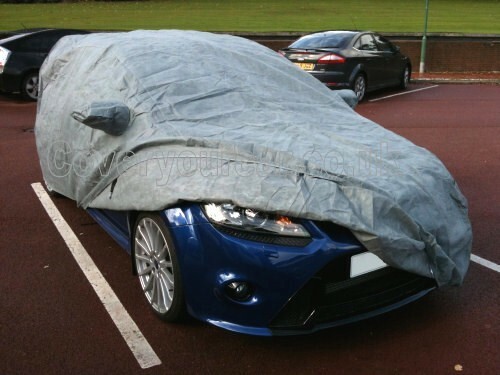 This 4 layer Stormforcer 4 layer cover for the Ford Focus RS MK 2 / MK 3 uses the very latest in 4 layer bonded car cover technology is now available via us in the UK. This fabric is unique, and is a result of years of research and development to produce a fully waterproof cover that is also breathable. These covers utilise high-tech manufacturing techniques to ensure the maximum protection of your car's paint and bodywork through years of service. All 4 layers are bonded together and the resulting fabric has a sturdy padded feel. Double stitched hems ensure long life and total outdoor protection. They are suitable for year round use in all weather conditions and are incredibly strong. In very low temperatures, the fabric remains pliable and in strong, hot sunshine they keep interiors cool and protect from top / interior fade, paint damage and other sunshine degeneration. Over the past years our Stormforce fabric has been improved again and again undergoing many improvements to now offer the ultimate protection in both Winter and Summer. Unique Breathable 4 layer fabric to allow moisture & damp to escape. Side panel eyelets for optional locking kit and integrated car cover alarm. Seperate sturdy zipped storage bag with waterproof lining. Ideal for frequent use or longer term outdoor storage. Details of the Stormforce Plus : Exclusive to us, featuring our new 360 degree Integrated Hemline Underskirt Tension System is born out of many years of listening to our customers and is quite simply the step up from the traditional standard 4 Layer Stormforce Cover. 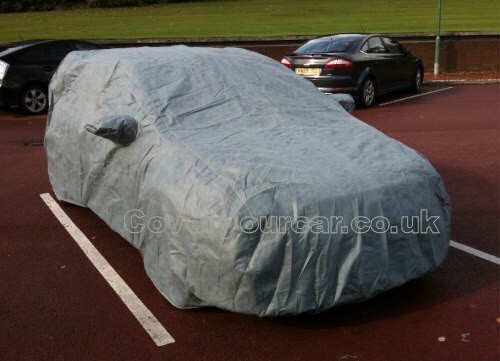 For customers wanting peace of mind when the car is left for long periods and covered in all weathers, we have added a unique hemline underskirt made from our long lasting Voyager material through which an elasticated tension cord to totally secure the cover to the car. This extra underbody system compliments the existing 2 x underbody straps that come on the basic Stormforce Cover, taking the pressure off the 4 x single strap points and spreading the tension evenly around the entire cover hem.